Very simple project: Go to Home Depot and purchase the very inexpensive “Cull” wood. Have them slice it up for you. Sand it. Paint it. My thoughts: I will stick to sewing for the most part, because I don’t have a steady enough hand to be a good painter. Plus I am impatient with it, since it’s a hard project to ‘leave out’ until you’re ready to come back. 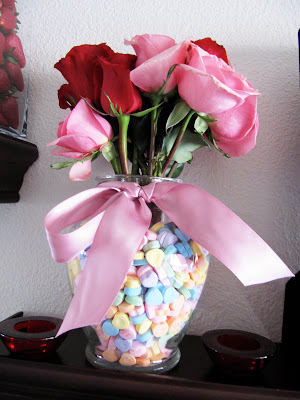 I’ve always wanted to do the candy hearts vase thing. Upon reflecting, this would look MUCH better with tulips, which kind of droop around, instead of being so stick straight like rose stems. 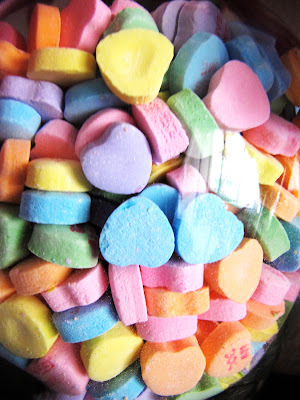 Isn’t it weird that there is only ONE candy heart that is turned with the message facing outward? 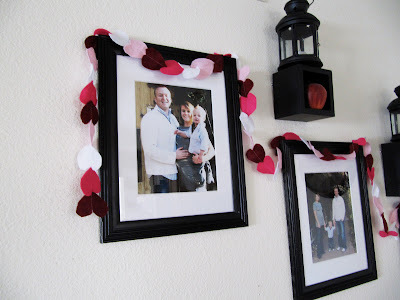 Felt Heart Garland: I ran out of light pink to make this longer like I wanted it to be, but this was probably the easiest and fastest project I did. 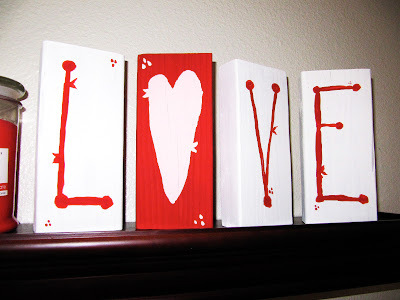 Cut out hearts out of felt, sew them together by machine. Tada! 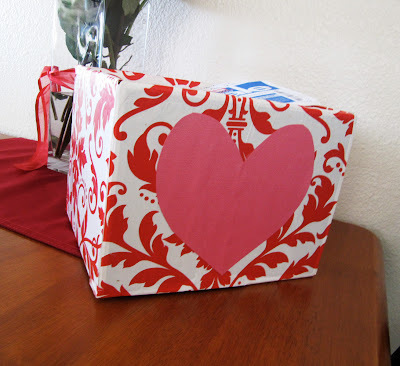 Mod-Podged Valentine’s Box: I wanted this to be like a love note box, where I could write lovely notes to my husband and son and leave in there to read. What a wonderful idea, until it turned into a sewing storage box. I just have too much stuff and not enough storage. But at least now it’s pretty! I’m pretty good and ready for this holiday to pass. Although I do have one mouth-watering sugar cookie recipe to try and a kid’s valentine’s making project. And one hot Friday night date without my child! Heidi, you're so cute! All of your crafts are adorable! Good job!